Good Magic and Hofburg sparkled as the 3-year-olds took center stage this weekend in Thoroughbred racing. Unique Bella notched another win. A bevy of top sprints also was on tap from coast to coast in a weekend that offered four "Win and You're In" events for November's Breeders' Cup. On the international front, Benbatl returned to the winner's circle in Germany, renewing hope he might challenge Winx in the Cox Plate during the Australian springtime; Poet's Word posted a narrow win in the King George; and For You was an impressive winner at Deauville in beautiful Normandy. Even without Justify, the 3-year-olds arguably are the best part of this group and Good Magic and Hofburg are right there with the best of them. [post_ads]On Sunday at Monmouth Park, last year's Breeders' Cup Juvenile and Eclipse Award winner Good Magic stalked the early pace in the $1 million Grade I betfair.com Haskell Invitational, took the lead on the turn and wasn't challenged in the stretch, winning by 3 lengths. Bravazo was best of the rest, 6 lengths ahead of Lone Sailor. Good Magic, a Curlin colt, ran 9 furlongs on a fast track in 1:50.01 with Jose Ortiz aboard. Good Magic's performance promises he will be a factor in the coming months, as does the automatic entry into the Breeders' Cup Classic he earned through the "Win and You're In" provision of the Haskell. The Grade II Blue Grass winner remains a relatively fresh commodity. He finished second to Justify in the Kentucky Derby and fourth in the Preakness. Trainer Chad Brown did not enroll him in the Belmont, instead prescribing rest up to the Haskell. "I am so proud of this horse," the trainer said. "He put everything together today. He showed his ability, his agility and his class today. It's not easy to win these races." "With Justify out, this horse is on top of the division," The Blood-Horse quoted Brown. "I think everyone would agree with that. He's still standing. He's a tough horse and I'm so proud of him. This horse trains on. He's a great racehorse and someday he'll make a great stallion." Then there's Hofburg. At midweek, Irad Ortiz Jr. was asked by NYRA media what horses excited him for the Saratoga meeting. He answered, "Hofburg." In Friday's restricted $100,000 Curlin Stakes, Hofburg showed that support isn't misplaced. Starting last of five, Hofburg moved up a bit around the turn, hit the lead early in the stretch run and kicked away to win by 5 lengths. After tracking a slow pace, he finished the 9 furlongs on a sloppy track in 1:50.18. The Tapit colt posted just his second win but also was second in the Florida Derby, seventh in the Kentucky Derby and third in the Belmont. "He was a little hot and a little agitated today," trainer Bill Mott said of Hofburg. "Frankly, I was a little bit concerned but I think mainly he just needed to run. He's a little bit fresh right now and I think he just wanted to get moving forward. Hopefully, when he comes back in the Travers he'll be a little cooler and a little more collected. He was a little pushy." The Grade I Travers, the "Midsummer Derby" runs Aug. 25. Saturday at the Spa, Tenfold tracked the pace made by Flameaway in the $600,000 Grade II Jim Dandy for 3-year-olds, eased by that one and won by 3/4 length despite failing to keep a straight line in the final sixteenth. Flameaway was second, a head in front of the late-running favorite Vino Rosso. Tenfold, a Curlin colt out of the Tapit mare Temptress, ran 9 furlongs on a fast track in 1:50.49 with Ricardo Santana Jr. in the irons. Tenfold finished third in the Preakness, just 3/4 length behind Justify, then was fifth in the Belmont. Flameaway was 13th in the Run for the Roses and a fading sixth in the Grade III Ohio Derby in his previous start. Vino Rosso was ninth in the Kentucky Derby and fourth in the Belmont. Trainer Steve Asmussen said the $1.25 million Grade I Travers on August is "what we were trying to get to with this race here today. I'm glad we ran him over this racetrack, because he does find something new all the time. Ricardo said when he moved away from that horse, he got a view of the screen in the infield and he couldn't get him to quit looking at it." Trainer Mark Casse said he is more likely to run his super filly, Wonder Gadot, in the Travers than Flameaway. And Mike Repole, owner of Vino Rosso, said, "The biggest key now, if we decide to go the Travers, is to get him to run 100 percent of the race and not 50 percent of the race." Name Changer came three wide down the lane to take Sunday's $150,000 Grade III Monmouth Cup by 1/2 length over Zanoti. Page McKenney was third, another 5 lengths back. Name Changer, a 5-year-old son of Uncle Mo, ran 9 furlongs on a fast track in 1:49.56 with Jose Ortiz riding. Name Changer, trained by Alan Goldberg, is 3-for-4 this year and the Monmouth Cup was his first graded stakes win. It was a bit closer than Unique Bella's many backers might have liked but the 1-9 favorite eventually got the job done in Sunday's $300,000 Grade I Clement L. Hirsch Stakes at Del Mar. After leading all the way, the 4-year-old Tapit filly opened up a 4-lengths advantage at the top of the stretch only to find La Force bearing down on her in the final yards. The margin was a thin 1/2 length with the other three still well up the track. Unique Bella ran 1 1/16 miles on a fast track in 1:44.40 with Mike Smith in the irons. "She ran okay," Smith said. "This wasn't her best race, but it was okay. She blew a shoe coming away from there and she was a little uncomfortable. When she heard that other mare coming, she surged again. This wasn't her best, but it was good enough." Winning trainer Jerry Hollendorfer added, "She's been off awhile and we wanted to get a win so we could plan her next race, which either will be back east or here. We're not sure yet." The Clement Hirsch was Unique Bella's fourth win from her last five starts. The only off-the-board finish of her career was a seventh in last year's Breeders' Cup Filly & Mare Sprint and she will have a chance to atone for that as Sunday's race was a "Win and You're In" for this year's Breeders' Cup Distaff. Farrell led from the start in Sunday's $200,000 Grade III Shuvee Stakes at Saratoga and held on at the end, winning by a neck over the favorite, Wow Cat, and another head over Verve's Tale. Farrell, a 4-year-old Malibu Moon filly, finished the 9 furlongs on a fast track in 1:49.35 with Channing Hill in the irons. She was coming off a pair of graded stakes runner-up finishes at Churchill Downs. "We were very happy with everything, obviously," said Farrell's trainer, Wayne Catalano. "When I saw 24-and-change (first quarter mile time), I was licking my chops. We had the first quarter going good. We need to win a Grade 1, so we'll see," he said of the Grade I Ketel One Ballerina Aug. 25. "This came up to our liking, so here we are standing in the winner's circle." Berned surged to a daylight lead at the top of the stretch in Sunday's $100,000 Molly Pitcher Stakes for fillies and mares at Monmouth Park, then held on gamely to win by 3/4 length over the onrushing Dream Call. The favorite, Divine Miss Grey, hooked up in an early pace duel and faded to finish third. Berned, a 4-year-old Bernardini filly, ran 1 1/16 miles on a fast track in 1:44.52 with Joe Bravo up for her first graded stakes win. In Saturday's $250,000 Grade II Bowling Green Stakes at Saratoga, Channel Maker raced a bit closer to the pace than is his usual wont, came after pacesetter Glorious Empire in the final sixteenth and was there just in time to ... finish in a dead heat for the win. It was a further 1/2 length back to Sadler's Joy in third. The favorite, Hi Happy, stalked the pace but gave way in the stretch run, finishing sixth. Money Multiplier was scratched. Channel Maker, a 4-year-old English Channel gelding, and Glorious Empire, a 7-year-old Irish-bred gelding by Holy Roman Empire, ran 1 3/8 miles on soft turf in 2:19.41. [post_ads]Trainer Bill Mott said Channel Maker "could possibly" run in the $1 million Grade I Sword Dancer Aug. 25 "if we get an invite." Glorious Empire's trainer, James Lawrence II, said that race "might be a little too close. We'll evaluate and let him tell us." March to the Arch took the wide way around in Saturday's $120,000 (Canadian) Toronto Cup at Woodbine but arrived in plenty of time to score by 1 3/4 lengths over Rose's Vision. Neepawa was third. March to the Arch, a Florida-bred Arch gelding, ran 9 furlongs on good turf in 1:48.07 with Gary Boulanger riding. Synchrony rallied from the back of the seven-horse field to win Sunday's $100,000 Grade III Oceanport Stakes for 3-year-olds at Monmouth Park. The 5-year-old son of Tapit, ridden by Jersey Joe Bravo, cleared in the final furlong, winning by 2 1/4 lengths over Doctor Mounty. The 1 1/16 miles on firm turf went in 1:42.05. Synchrony started the year with a pair of graded stakes wins at Fair Grounds and was coming off a third in the Grade III Arlington Handicap July 7. Elysea's World found a late burst of speed in Sunday's $100,000 Grade III WinStar Matchmaker Stakes at Monmouth Park, surging past the odds-on favorite, Dream Awhile, to win by a neck. Five lengths farther up the track, Special Event was third. Elysea's World, a 5-year-old Irish-bred mare by Champs Elysees, reported in 1:47.70 for 9 furlongs of firm turf. Jose Ortiz applied the winning ride. It was her second win from four starts this year. Way to Versailles was up in the last strides to win Sunday's $175,000 (Canadian) Grade II Royal North Stakes for fillies and mares at Woodbine by a nose over Smiling Causeway. The favorite, Lull, was another 2 1/2 lengths back in third. Way to Versailles, a 4-year-old Tizway filly, ran 6 furlongs on firm turf in 1:08.00 with Eurico Da Silva up for trainer Kevin Attard. It was her second straight win and first step into graded stakes company. Imprimis pressed the pace in Sunday's $80,000 Wolf Hill Stakes at Monmouth Park, took over the advantage in the stretch and won by 1 length over Pool Winner. Proforma was third. Imprimis, a 4-year-old Broken Vow gelding, finished about 5 1/2 furlongs on firm turf in 1:01.69 under Jose Ortiz. Trained by Joe Orseno, Imprimis now has five wins from six career starts. His only loss came in the Grade I Highlander at Woodbine in June where he was sixth after some traffic issues. Ransom the Moon came five-wide into the stretch in Saturday's $300,000 Grade I Bing Crosby Stakes at Del Mar and easily outfinished Roy H., winner of the 2017 Breeders' Cup Sprint. The margin was 2 1/2 lengths with Roy H. hanging on to second by 1/2 length over Touching Rainbows. Ransom the Moon, a 6-year-old son of Malibu Moon, ran 6 furlongs on a fast track in 1:10.08 with Flavien Prat up for trainer Phil D'Amato and earned a "Win and You're In" berth in November's Breeders' Cup Sprint at Churchill Downs. "I was thinking I was riding this horse up too close," Prat said. "I might have been taking his kick away from him. So today I went a different way. We had a big field and I knew there would be some pace, so I sat back with him. Then he came running. I had a lot of horse." Ransom the Moon and Roy H. also finished 1-2 in the 2017 Bing Crosby -- the race in which Drefong ducked in at the gap, dropping Mike Smith. Ransom the Moon, however, had not won in four intervening starts while Roy H. detoured to Dubai, finishing third in the Group 1 Dubai Golden Shaheen. Imperial Hint, runner-up in last year's Breeders' Cup Sprint, had no trouble with a sextet of rivals in Saturday's $350,000 Grade I Alfred G. Vanderbilt Handicap at Saratoga, surging to the lead in the lane and coasting home first by 3 3/4 length. Warrior's Club and Sweetontheladies got the minor awards. Imperial Hint, a 5-year-old son of Imperialism, ran 6 furlongs on a fast track in 1:08.98 with Javier Castellano riding. He now is 3-for-4 this season with the lone loss coming in the slop in the Grade II Churchill Downs on Derby Day. "That's the way I wanted to see him win," said trainer Luis Carvajal Jr. "For Imperial Hint, it's great to have a Grade I. I think I'll go back to the barns and see how he came back." He said the horse's next star will "probably" be in New York, adding, "We don't know yet. I'll pick a spot. Now, I have to keep him sound and healthy and hopefully I can go back to the Breeders' Cup. Probably right now, I'll keep him at three-quarters." One race before the Vanderbilt, Promises Fulfilled accelerated through the stretch run to win the $200,000 Grade III Amsterdam for 3-year-olds by 3 1/4 lengths from Engage. Barry Lee was third, another 9 1/4 lengths in arrears. Promises Fulfilled, a Shackleford colt, ran 6 1/2 furlongs in 1:15.18 under Luis Saez after the 3/4 mile went in 1:08.53. Promises Fulfilled faded badly in both the Florida Derby and the Kentucky Derby, finishing well up the track. He rebounded when send 7 furlongs in the Grade II Woody Stephens at Belmont, holding third after showing the way. "The horse has done so well since Belmont Day that I just didn't see him losing it, and I'm usually a pessimist, but he's just changed," said winning trainer Dale Romans. "He turned a corner. It's like he's a man now. I think we're going to see bigger and better things out of him." Romans noted he has been going through a rough patch but, "In this game, you just don't know. I've been saying I haven't won a race in a month, been having the blues the last week or two -- all you need is to win at Saratoga and life is good again." At Woodbine, Wyatt's Town led all the way in Saturday's $120,000 (Canadian) King Corrie Stakes for 3-year-olds and held of the late run of Hemp Hemp Hurray by 1 length. Run Away was another 2 1/2 lengths behind in third. Wyatt's Town, a Speightstown colt, ran 6 furlongs on the all-weather track in 1:09.73 with Eurico Da Silva riding. Previously raced at Churchill Downs and Oaklawn Park, the colt scored his third straight win. He has not finished off the board in nine career starts. 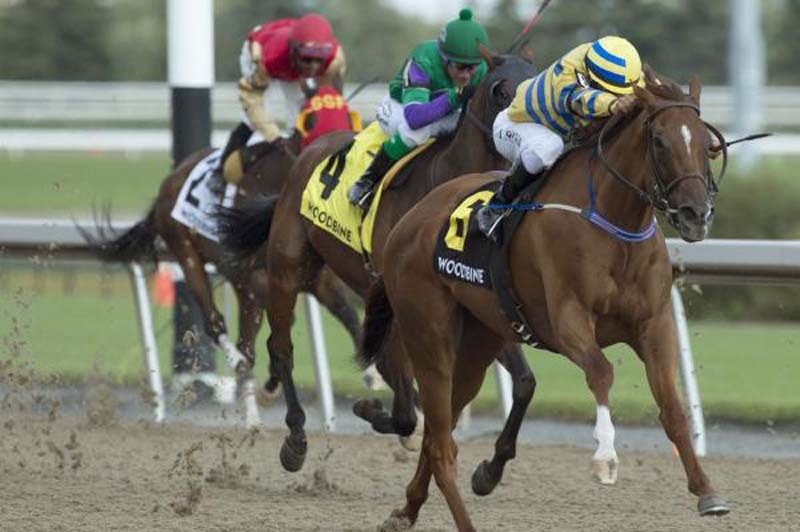 At Woodbine, Pink Lloyd started another stakes winning streak -- perhaps -- with a 2-lengths win over Yorkton in Sunday's $125,000 (Canadian) Grade III Vigil Stakes at Woodbine. The 6-year-old Old Forester gelding had a remarkable skein of 11 straight stakes wins snapped in his previous start but showed no ill effects in the Vigil, stalking the pace before driving clear. He ran 6 furlongs on the all-weather track in 1:09.26 with Eurico Da Silva up for trainer Robert Tiller. Just Grazed Me rallied from mid-pack in Sunday's $150,000 Fleet Treat Stakes for California-bred fillies and mares and kicked away in the late going to win by 3 1/2 lengths. Show It N Moe It was second, 3 1/4 lengths in front of One Fast Broad. Just Grazed Me, a Grazen filly, ran 7 furlongs on a fast track in 1:23.60 with Tyler Baze riding. Chasing Yesterday, a half-sister to American Pharoah, was an easy and popular winner in her first start in Saturday's first race at Del Mar. The Tapit filly, out of American Pharoah's dam, Littleprincessemma, stalked the lead, took over when asked by jockey Mike Smith and won by 4 1/4 lengths as the odds-on favorite. Bob Baffert trains her, as he did the Triple Crown winner. Poet's Word caught Crystal Ocean inside the final furlong and won a tight finish in Saturday's Group 1 King George VI and Queen Elizabeth at Ascot Racecourse. Sir Michael Stoute trains both the top finishers. Coronet was a distant third and Cracksman was a non-starter as the course remained dry and on the firm side for trainer John Gosden's preference. It appeared at mid-stretch that jockey James Doyle had left Poet's Word too much to do as William Buick had taken Crystal Ocean out to a commanding lead. But, despite drifting slightly right in the final 100 yards, Poet's Word, a 5-year-old son of Poet's Voice, got the job done -- by a neck -- at the end of the 1 1/2 miles. After starting his season finishing second to Hawkbill in the Group 1 Dubai Sheema Classic, Poet's Voice won the Group 3 Brigadier Gerard at Sandown and the Group 1 Prince of Wales's Stakes at Royal Ascot. The King George was his first victory at 1 1/2 miles and earned him a spot in the starting gate for the Breeders' Cup Turf this fall at Churchill Downs through the International Challenge Program. Coming up next week is the Qatar Goodwood Festival or "Glorious Goodwood." This is another of those quintessentially British institutions -- a midsummer "relax" from the formality of Royal Ascot, yet with an expectation of flair and style. The racecourse itself has a colorful history, entwined since the first years of the 19th Century with the successive Dukes of Richmond. The five days of Glorious Goodwood boast a trio of Group 1 events: Tuesday's Qatar Goodwood Cup at 2 miles, a part of the British Champions Series; Wednesday's Qatar Sussex Stakes at 1 mile; and Thursday's Qatar Nassau Stakes for 3-year-old fillies and mares at about 1 1/4 miles (1 mile, 1 furlong and 197 yards). With You, always close to the lead, asserted her dominance in the final furlong of Sunday's Group 1 Prix Rothschild for fillies and mares at Deauville, clearing to win by 3 lengths. The Godolphin pair of Crown Walk and Rosa Imperial finished second and third. With You, a 3-year-old George Strawbridge homebred daughter of Danehill, got the 1 mile over good to soft going in 1:36.52 with Aurelien Lemaitre riding for trainer Freddy Head. With You won both starts as a 2-year-old but came to the Rothschild off a fifth-place finish in the Group 1 Prix de Diane Longines in June. Head said he will have to discuss it with Strawbridge but predicted With You might be with the Deauville crowd again for the Group 1 Prix Jacques Le Marois, where she could meet Alpha Centauri, who is riding a three-race, Group 1 winning streak in England and Ireland. Benbatl was much the best in Sunday's Group 1 Grosser Dallmayr Preis - Bayerisches Zuchtrennen in Munich. With Oisin Murphy in for the ride, the Saeed bin Suroor trainee inherited the lead early and was in control thereafter, winning by 2 3/4 lengths over Stormy Antarctic. Va Bank and Iquitos were third and fourth. Benbatl, a 4-year-old Dubawi colt, won the Group 1 Dubai Turf at Meydan on World Cup night but finished a fading 10th as the favorite in the Group 1 Queen Anne at Royal Ascot. The German rebound now restores Godolphin's option of sending the colt Down Under to challenge Winx's bid for a fourth straight Cox Plate. Bin Suroor said the Juddmonte International at York and the Irish Champion Stakes also are under consideration. Fly to Mars stalked the pace in Saturday's $150,000 California Dreamin' Stakes for state-breds, took over the lead in the lane and ran on to win by 1 length from an onrushing Grecian fire. B Squared was third and the favorite, Pee Wee Reese, booted this one, fading from the lead to finish seventh. Fly to Mars, a 4-year-old Ministers Wild Cat gelding, got 1 1/16 miles on firm turf in course-record time of 1:39.50 with Flavien Prat aboard. Archer Road came four-wide into the stretch in Saturday's $60,000 Copingaway Starter Stakes, worked his way to the lead and held gamely, winning by 1/2 length over Kikinboy and the same margin over Affluential. Archer Road, a 4-year-old Leroidesanimaux, ran 1 1/2 miles on firm turf in 2:38.60 with Jeffrey Sanchez riding. Bella Vincenza rallied through the stretch to win Saturday's $75,000 Added Elegance Stakes for fillies and mares by 1 1/2 lengths over She Takes Heart. It was another 2 lengths back to Sweet Tooth Haven in third. Bella Vincenza, a 4-year-old filly by Biondetti, ran 7 furlongs on a fast track in 1:22.99 with Luca Panici in the irons. Still There went to the lead at the top of the stretch in Saturday's $75,000 Twixt Stakes for fillies and mares and was still there at the finish, winning by 3 1/2 lengths from Lake Ponchatrain. The favorite, Bishop's Pond, was a neck behind that one in third. Still There, a 4-year-old Union Rags filly, ran 7 furlongs on a fast track in 1:21.72 for jockey Jevian Toledo. Smarty River Pants drew off in the final furlongs to win Saturday's $50,000 (Canadian) Princess Margaret Stakes for 2-year-olds by 9 lengths over Thatsafactjack. Only One Kiss was another 1 1/4 lengths back in third. Smarty River Pants, an Alberta-bred gelding by Afleet Alex out of the Smarty Jones mare Smarty Jill, ran 6 furlongs on a fast track in 1:12.36 with Wilmer Galviz up. Tara's Way stalked the pace in Saturday's $50,000 (Canadian) Duchess of York Handicap for fillies and mares, took over on the turn and won by 1 1/4 lengths over Anstrum. The favorite, Sail On By, was third. Tara's Way, a 5-year-old daughter of Tizway, ran 1 1/16 miles in 1:45.94 with Shamaree Muir up.